A shiftless young man becomes obsessed with a mysterious woman and yearns to find her again. On the South Pacific island of Bora Bora, a young couple's love is threatened when the tribal chief declares the girl a sacred virgin. An aging doorman, after being fired from his prestigious job at a luxurious Hotel is forced to face the scorn of his friends, neighbours and society. A Chicago waitress falls in love with a Minnesota farmer, and decides to face a life in the country. The demon Mephisto wagers with God that he can corrupt a mortal man's soul. Dr Eigil Borne is engaged to Hélène, a girl who is madly in love with him. At Hélène's birthday celebration, Eigil invites her to a cabaret, where he meets his other love, Lily, a passionate, fiery and funny dancer. Triangle story: painter, his young male model, unscrupulous princess. In 1992, an Italian TV channel showed a two-week late-night retrospective of Silent films, the bulk of which were expressionist classics. Unfortunately, I missed out on a couple of these and TARTUFFE was among them. More than a decade had to pass before I could watch it, by which time I had come to consider Murnau - despite the fact that only a small portion of his work has survived the ravages of time - as one of the undisputed masters of cinema. For some reason, TARTUFFE has been little-seen over the years so that it never had much of a reputation (which may explain why I by-passed its sole TV showing to begin with! ); having watched the film now, it clearly emerges as a masterwork from the golden age of German cinema and its place in Murnau's irreproachable canon (still impressive 75 years after the director's untimely death!) should not be overlooked. Having watched OTHELLO (1922) - which also starred Emil Jannings and Werner Krauss - relatively recently, I couldn't help noticing that it offers an interesting role-reversal with Murnau's film for these two powerhouse actors; in fact, Jannings' larger-than-life performance here is played alongside an impressively restrained turn from Krauss (whom I had previously only seen essaying villainous characters). One of TARTUFFE's most interesting elements is its 'film-within-a-film' structure that looks back to THE CABINET OF DR. CALIGARI (1919; featuring Krauss's most famous role, interestingly enough) and forward to Hiroshi Teshigahara's THE FACE OF ANOTHER (1966) - which, coincidentally, I watched the very next day (my review of which is shortly to follow) without having prior knowledge of this! Criticized at the time for being a pointless flourish on the film-makers' part, I strongly feel that - with respect to TARTUFFE, at least - this device merely underlines the universality of the main theme being dealt with. I see, however, a third connection at play here, this time with Murnau's own NOSFERATU (1922): Tartuffe is presented as a different form of bloodsucker, one who is not undead but very much alive (or human, if you like), and just as dangerous - not to mention that much more common in our daily life than the vampire of myth and literature; besides, the fact that - as in NOSFERATU - here it is the devoted wife of the man under the influence of Moliere's symbolic figure of hypocrisy ("From now on, all hypocrites shall be called 'Tartuffe'!" reads a subtitle) who brings about his come-uppance, by 'sacrificing' herself, only helps reinforce this particular aspect. Despite the film's relative brevity (explained in my notes for the accompanying documentary below), its intimate nature, and also the fact that Murnau was handed the project at short notice, his trademark stylistics of expressionistic lighting and acrobatic camera-work are well in evidence. Finally, I would like to say something about the English subtitles - displayed over the original German intertitles - for all three of "Masters Of Cinema"'s Silent releases (the others being, of course, SPIONE  and ASPHALT ): I admire Eureka/MoC's decision to preserve authenticity in every aspect of their DVDs, but the interweaving text (with the English translation appearing in too small a font) makes it a comparatively labored read overall! At this juncture, I truly regret missing out on the retrospective of Murnau's work shown a few years back at London's National Film Theatre - and I can only long for the time I will be able to watch the likes of JOURNEY INTO THE NIGHT (1921), THE HAUNTED CASTLE (1921; when I was in Hollywood I held in my hands a DVD-R of this film but, since it had been announced for DVD release by Image, I didn't rent it), THE BURNING SOIL (1922), PHANTOM (1922; the same comments for THE HAUNTED CASTLE apply here, its DVD release from Flicker Alley has been imminent for some time now! ), THE GRAND DUKE'S FINANCES (1924) and CITY GIRL (1930). It's inconceivable how the work of such an important film-maker, so long as it is available, is kept mysteriously under wraps - thus denying film buffs everywhere the opportunity of enjoying it! The 41-minute documentary, TARTUFFE: THE LOST FILM (2004; TV), is an essential watch for fans of Silent films and director F. W. Murnau: although TARTUFFE may not be among Murnau's greatest films, it is certainly one of his most personal as he identified himself with the young relative who is shunned from his inheritance because he has chosen the lowbrow way of the artist rather than a more lucrative profession. 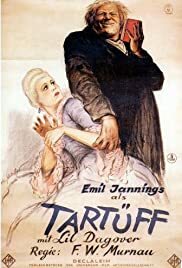 Besides, the documentary highlights the depressing state of most Silent films in existence today: while we should consider ourselves lucky that the U.S. theatrical version of TARTUFFE (from which the DVD transfer was made) is in such a good state, it is considerably shorter than the original German version. Fragments of the lost scenes shown in the documentary include a couple of key sequences which, as incomplete as they are in the film now, seem a little rushed. Although the quality is understandably inferior, one wonders why they weren't included in the main feature itself.